Home / biogamer girl / gaming news / PC / Playstation 3 / R.A.W. 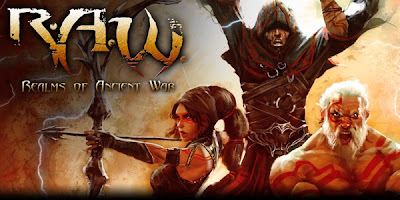 Realms of Ancient War / Xbox 360 / R.A.W. : The Wizard Unleashes its Power in Video! R.A.W. - Realms of Ancient War, the explosive Hack'n'Slash developed by Wizarbox for Xbox LIVE, PlayStation Network and PC, today unveils the Wizard, the second of the three playable heroes in the game! After presenting the Warrior last time, the Wizard is the focus of a new trailer that’s full of action packed powerful spells! While the Warrior excels in hand-to-hand combat, the Wizard is talented at long range attacks, where he decimates entire armies with devastating spells. The Wizard masters the natural elements and can unleash lightning, torrents of flames, tornadoes and waves of pure energy... as long as his mana pool is full. However, such tremendous power has a drawback: the Wizard is the most fragile of the heroes, and he will not stand very long should the enemy reach him! Plunge into a hail of deadly beasts and devastating spells in this new video, entirely devoted to the Wizard of R.A.W.! R.A.W. – Realms of Ancient War is an explosive Hack’n’Slash for PlayStation Network, Xbox LIVE and PC developed by Wizarbox, taking you on a continent ravaged by a war that raged ten years earlier. The four Kingdoms of Men, Elves and Dwarves lay in ruins, preyed on by raiders and looters. In this chaos, a new, unknown threat is looming... To discover its true nature, the kingdoms sent detachments to investigate, a dangerous mission from which no one returned. But what about you? You, who were in the wrong place at the wrong time... Take control of a powerful Warrior, a dark Sorcerer or a Rogue master of stealth, and plunge into a grand quest full of action! The world of R.A.W. leads you, alone or in 2-player co-op, through many levels as rich as varied in every corner of the continent. Along your quest, the experience gained through the violent battles you will fight and the weapons and magic items you will loot on the lifeless bodies of your opponents will allow you to develop the power of your chosen character. You will learn new powers and spells ever more devastating, some of which, when mastered, will allow you to inflict tremendous damage and eradicate several dozens of enemies at once… as they will often rally in hordes to fight you! All the power you will be granted will not be too much to exterminate your outnumbering enemies. Thanks to your gift of incarnation, you will even be able to take direct control of the body of your most powerful foes, seeding discord and destruction right at the heart of enemy armies! Invite a friend to join your adventure in an exciting co-op mode, where coordination and teamwork are essential ingredients of victory! R.A.W. - Realms of Ancient War will be released on Xbox LIVE, PlayStation Network and PC 2nd quarter of 2012.